This Spinach and Artichoke Dip Crock Pot Recipe is Applebee's to the Tee! My favorite appetizer is spinach and artichoke dip and my favorite kitchen appliance is the crock pot – so how fitting that today I am bringing my favorite spinach and artichoke dip crock pot recipe to you? You’re going to love serving this hot appetizer at parties, mostly because it is so stinkin’ easy to make. If you like hot appetizers that can serve a lot of people, this is the hot dip for you! Imagine for just a second that I’m going to tell you that this slow cooker spinach artichoke dip is basically a salad. Ha! I know! Friends couldn’t believe that this was real fresh spinach in my dip when I recently served it at a football party at our house either! In case you’re wondering if you can you use fresh spinach for spinach artichoke dip like my girlfriends were so perplexed by, the answer is YES! You sure can. And, I’m here to tell you, it’s absolutely delicious! If you want to cook down the spinach before using it in a dip you can see how to do that here. The flavors all come together in such a way that it literally tases like it would from a restaurant (hello, Applebee’s, I’m talking to you!) Although, if you were to buy this amount from Applebee’s, you’d be paying big bucks because this recipe makes about 4-5 cups of dip! Can Spinach and Artichoke Dip be Made Ahead? 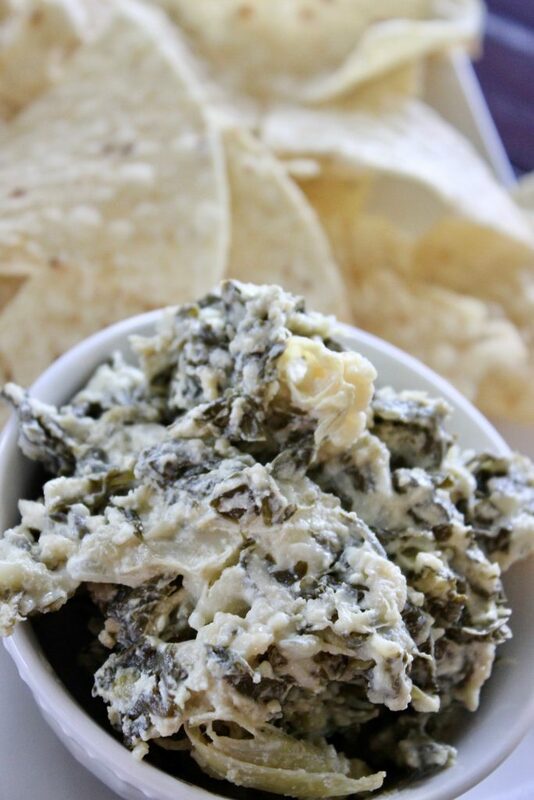 How to Make Spinach and Artichoke Dip Like Applebees? If your goal is to make spinach and artichoke dip that tastes like Applebee’s, follow my recipe exactly. And, the best part is that you can double, and even triple the recipe. What Goes with Spinach and Artichoke Dip? 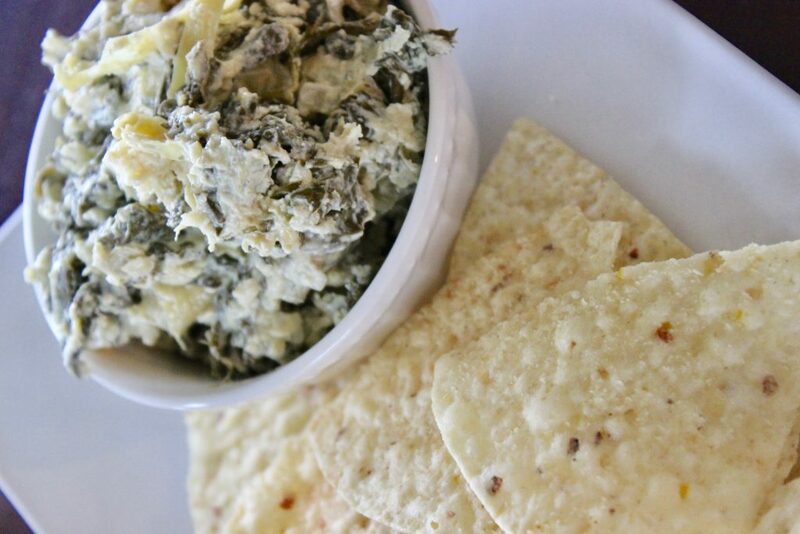 You can serve anything on the side to dip into spinach and artichoke dip – that’s the great part! 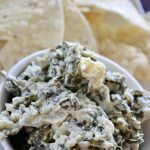 While I prefer to use Stacy’s Pita Chips, the tortilla chips are always the most popular dipper when I make this spinach dip. Can I use this spinach dip for Spinach and Artichoke Dip Stuffed Chicken? This is an AWESOME way to use this spinach dip! Just make sure that if you use this as a filling for stuffed chicken breast, salmon or whatever the case, cook the meat all the way so that it’s safe. Anyways, let’s get to gettin’ – Here’s how you assemble this Spinach and Artichoke Dip with Fresh Spinach. 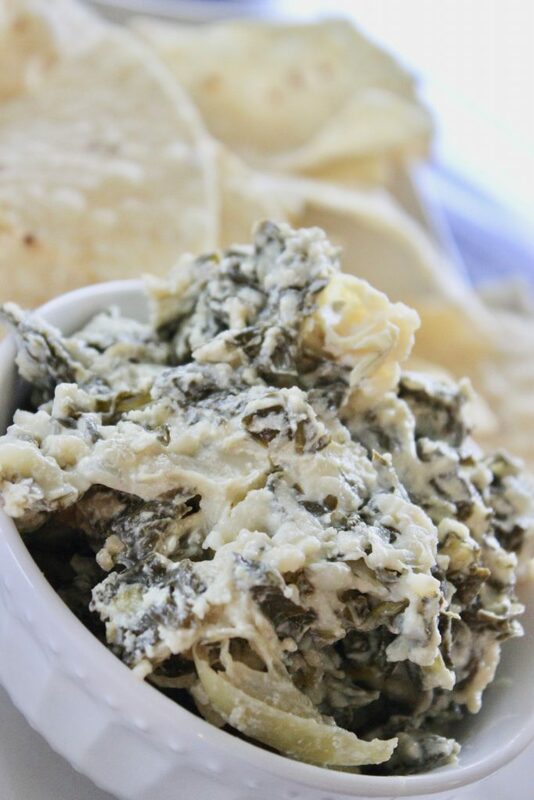 My favorite appetizer is spinach and artichoke dip and my favorite kitchen appliance is the crock pot - so how fitting that today I am bringing my favorite spinach and artichoke dip crock pot recipe to you? You're going to love serving this hot appetizer at parties, mostly because it is so stinkin' easy to make. Heat on high 1-2 hour or low 2-4, stirring every 30 minutes to 1 hour. Serve out of crock pot or transfer to serving dish. Serve with tortilla chips or pita chips. Enjoy!